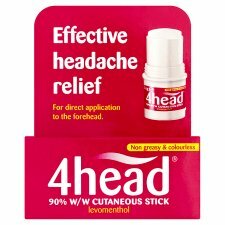 4head is a cutaneous stick for external application. Important; read and retain enclosed leaflet for full directions on how to use. Apply gently across the forehead taking care to avoid the eyes. For single patient use. Use as required but avoid excessive use. If symptoms persist or worsen seek medical advice.